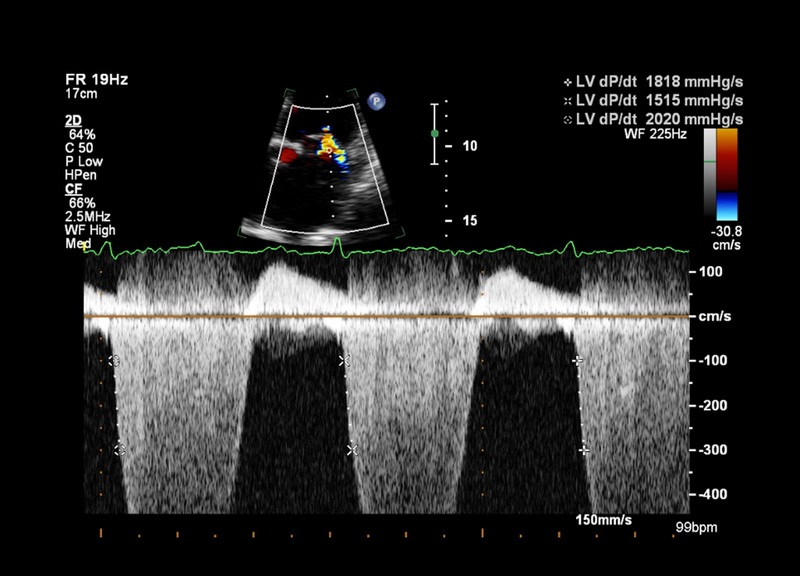 In a recent blog post we looked at the use of E-point septal separation (EPSS) as a surrogate marker of left ventricular systolic function. In this blog, we're going to look at another surrogate marker, namely dP/dt. When left ventricular systolic function is normal, there is a rapid rise in left ventricular systolic pressure during systole. The rate at which the ventricular pressure rises is expressed by the term dP/dt, which is the rate of change in pressure (dP) with time (dt). If left ventricular systolic function becomes impaired, the rate of rise in pressure is slower and therefore dP/dt starts to fall. It's possible to measure dP/dt using echocardiography, but only if mitral regurgitation is present. To make the measurement, we need to obtain a continuous wave (CW) Doppler trace of the mitral regurgitation (MR) from the apical 4-chamber view. It's helpful to set the sweep speed as high as possible, to 'spread out' the trace (this makes it easier to take the measurements). Freeze the CW Doppler trace, and using the calipers mark the points where the mitral regurgitation jet velocity is 1 m/s and 3 m/s. You need to measure the time interval between these two points, i.e. the time taken for the MR jet velocity to rise from 1 m/s to 3 m/s. The illustration above shows how this measurement is made. We know from the Bernoulli equation that when the MR jet velocity is 1 m/s, the pressure gradient 'driving' the jet is 4 mmHg (pressure gradient = 4 x velocity squared). Similarly, when the MR jet velocity is 3 m/s, the pressure gradient driving it is 36 mmHg. From this, we can deduce that the change in pressure between the two time points is 32 mmHg (36 mmg minus 4 mmHg). It's now possible for us to calculate dP/dt, by dividing 32 (the 'dP') by the measured time interval (the 'dt'). The longer it takes for the pressure in the left ventricle to rise during systole, the longer the duration of dt, and therefore the smaller the value of dP/dt. When left ventricular systolic function is normal, dP/dt is usually >1200 mmHg/s. As left ventricular function deteriorates, dP/dt falls. A severely impaired left ventricle usually has a dP/dt <800 mmHg/s. So, if your patient has measurable mitral regurgitation, you can use the dP/dt method to assess their left ventricular systolic function. However, there are a couple of pitfalls - the dP/dt method isn't reliable if the mitral regurgitation is acute, or if there is significantly increased afterload (aortic stenosis or systemic hypertension). Chung N, et al. 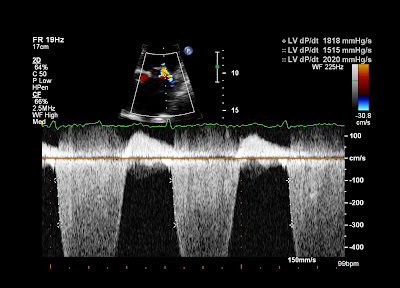 Measurement of left ventricular dP/dt by simultaneous Doppler echocardiography and cardiac catheterization. J Am Soc Echocardiogr 1992; 5: 147-152.